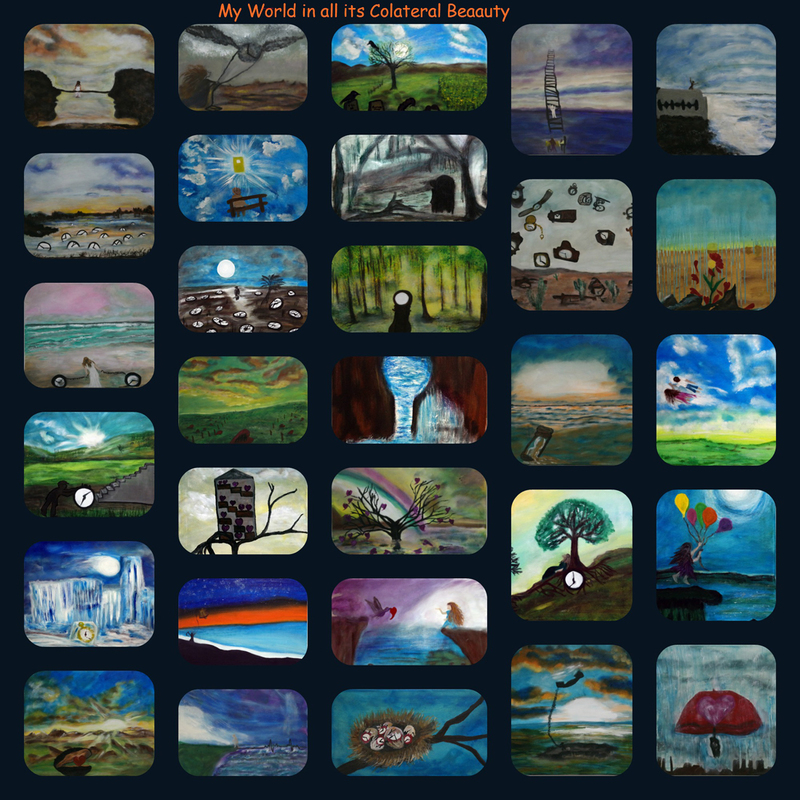 Introducing "My World in all its Collateral Beauty"
When I look at this collage I see that I was extremely busy this month. When you are in it you don't actually notice how much you are doing. These paintings are a representation of a genre that I had never delved into before, surrealism, although my artist friend Cory tells me that my work is a heartbeat away from it:) I stretched myself as an artist and I am ready for all my artistic challenges this year. I want to thank all those that followed along in this journey and supported me you know who you are:) with comments as this spurred me on. I thank my family and friends for letting me ramble on about what I was planning on painting next, this was a thinker to say the least. I end this challenge with a quote from the movie that started the theme of Love Death and Time. "Just be sure to notice that collateral beauty is the profound connection to everything". Be well,. Introducing "Love Leads the Way"
I end my 30 day theme with Love. Without it the world stops.This painting celebrates the love we have for humanity, for our friends, our family and our significant other. Love creates possibilities, it is the driver in our day to day lives. We cheer each other on. we celebrate the good times and we are there for the not so good times . Everything is not always flowers and rainbows the rain has to fall from time to time and that too is when Love takes us by the hand and has a shoulder to rest and sometimes to cry on. Love is a powerful tool that you can give to each other, it has the power to overcome many of life's obstacles, it has the power to create a family out of strangers and friends, it has the power to heal. If everyone in this world let Love lead the way this world would be changed forever. 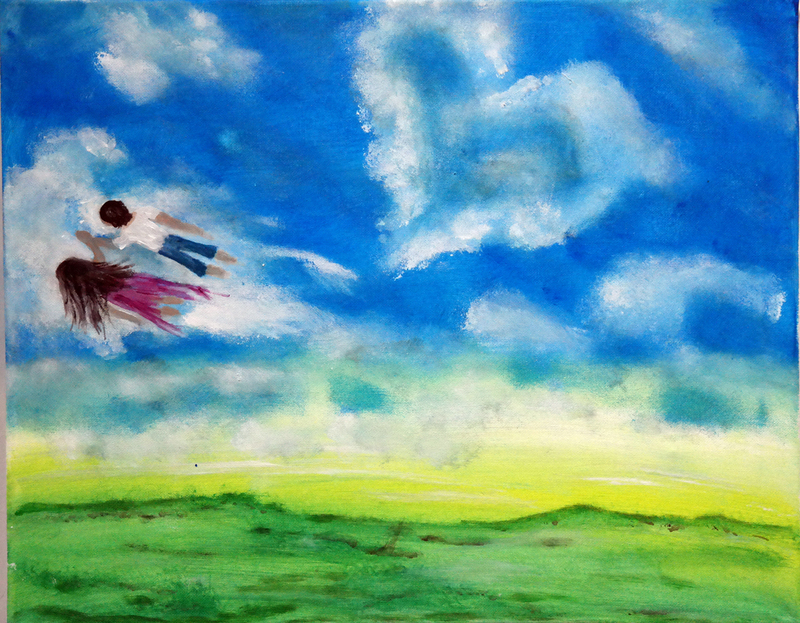 The surreal depiction of love is seen both in the formation of the clouds and the two people flying together hand in hand into the sky. 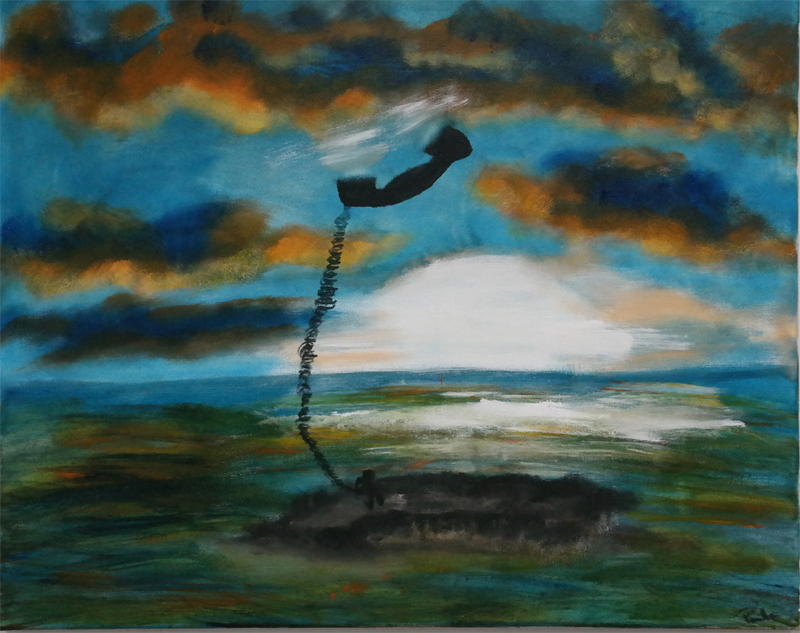 It has an uplifting message , pardon the pun;) and I am happy that I end this challenge with this painting. 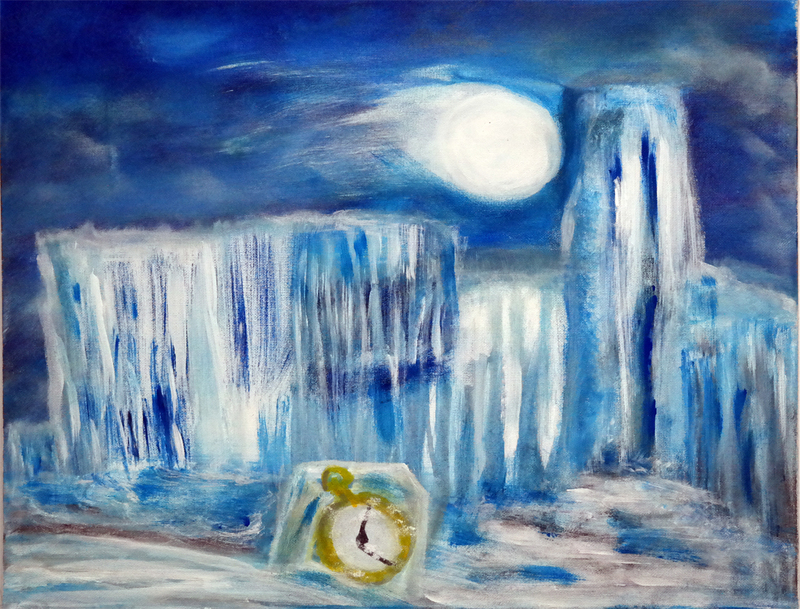 Painting Size 16" X 20"
This is my last surreal depiction of time for this challenge. We all get caught up in trying to plan for the future and reminiscing or regretting the past. These are things that we can no longer change or worry about what is going to happen. Today, this moment is what we have and we forget to enjoy that moment, realize it, sink into it and be ever grateful for it. This is one of my favorite book quotes about living in the moment. I have rendered the past, present and future using my all time favorite, the tree. Each tree shows us the past the present and the future. 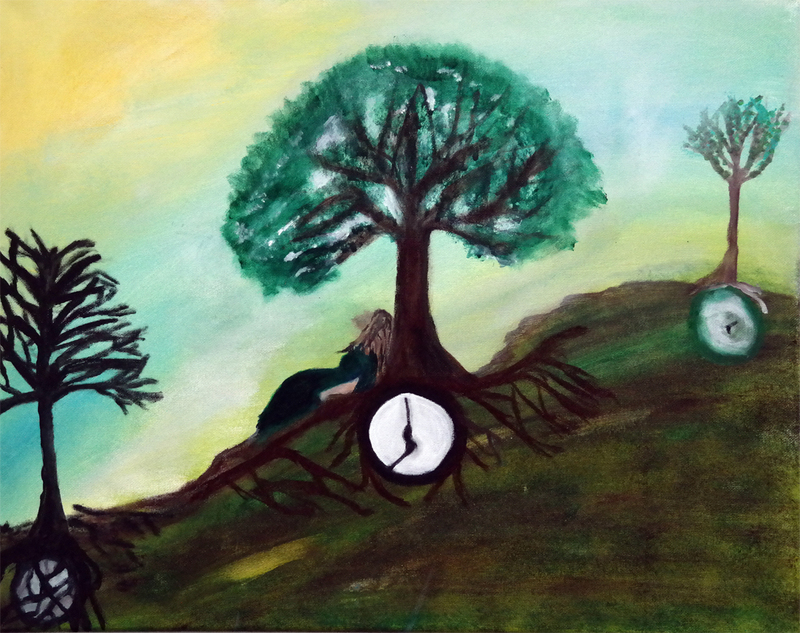 Underneath each tree is a clock with the past being covered in old roots and the future just beginning and the present being what it is right now. The figure in the picture is enjoying herself , by living in her present moment. 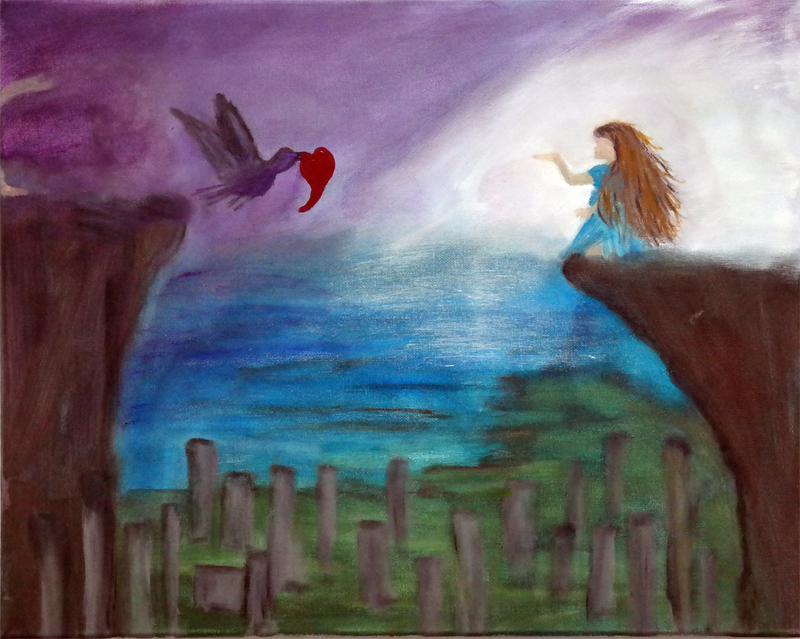 This is my last painting on the surreal depiction of death in this challenge. For the most part my paintings on this subject have been about the positive, of going beyond and it being that next step in our journey. This one is not that. This one depicts that which has taken so many from this world and my personal world, way too soon. I have visually depicted Cancer in all its ugliness, its sneaky demeanor, hiding, waiting to select its next victim. This insidious disease is part of us, it is in our genetic code and no one knows what triggers those cells to suddenly turn on each other and kill its host. The treatments we have for it are barbaric and torturous at best. This can take the healthiest, strongest and most loved of us at its whim, it does not discriminate. It does not only steal that person from you it leaves a vileness behind it and too many unanswered questions. 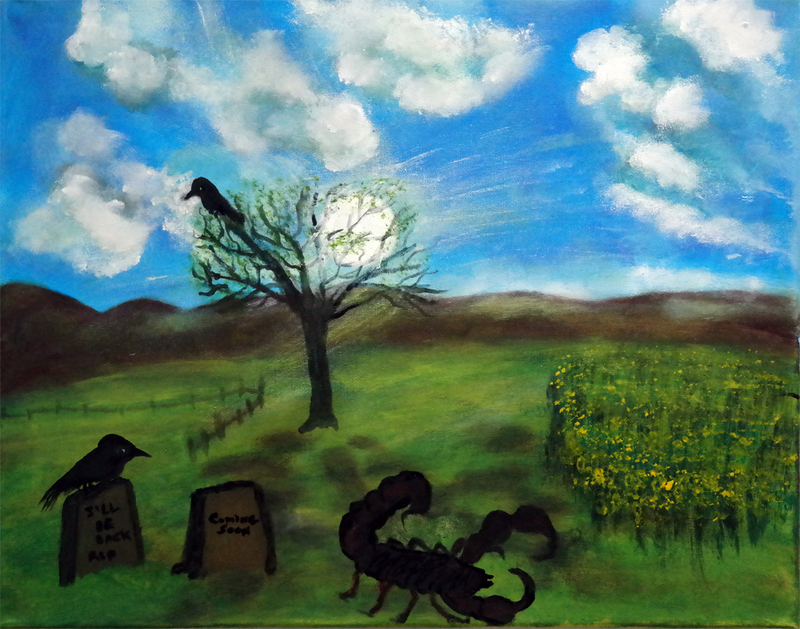 I have used a bleak forest scene in this painting and have depicted Cancer as the sneaky black figure and the dark depths from which it comes from as the blackness of an opening from which it comes to steal from our world. Painting Size 10" X 20"
Is there a moment in your life hat you wish you could relive again? Is it a moment that you would change or a moment that you will cherish forever. We all have those moments that are indelibly etched in our minds. Sometimes they are accompanied by an intense feeling that you wish would return yet never will, these are the moments frozen in time. My first winter scene appropriate because we are in the heart of winter usually up to our eyebrows in snow, but not this year we are having a weird springlike winter. 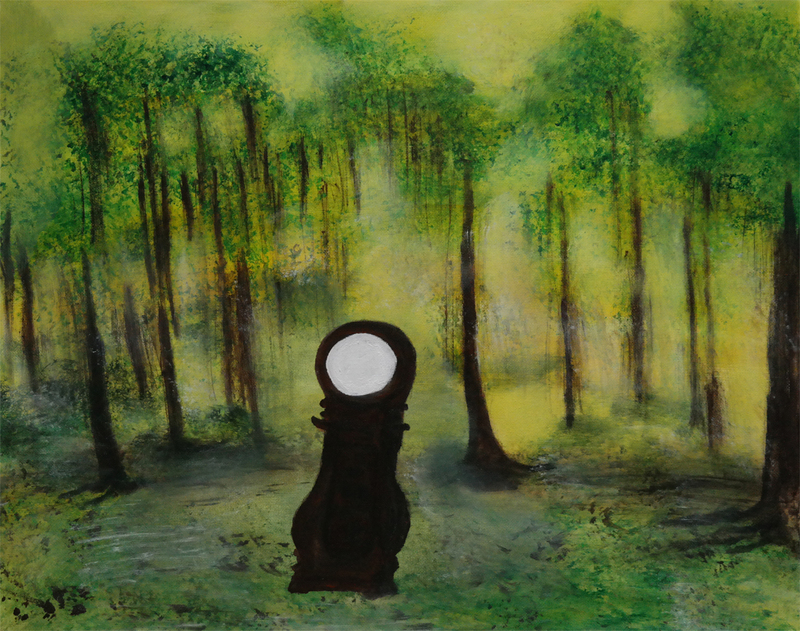 copy from here --> Introducing "The Lost Key"
I really like this painting I am a huge critic of my own work but this one I enjoy. It started with a photo of a heart shaped key and my imagination took it from there. It was one of those fluid paintings the kind that just flow onto the canvas with very little conscious thought. I don't have a story for it so I think I am going to turn it over to the viewer. What does this painting say to you.? I would love to hear your thoughts. 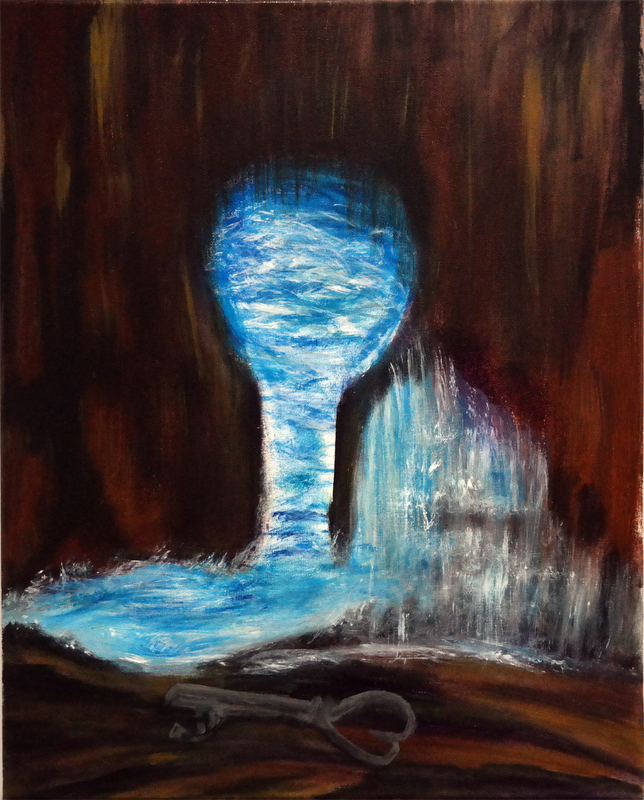 The surreal depiction of a keyhole opening, a cave and water, with a key, what does it unlock ? Who left the key there, why is it there? Why is the key shaped like a heart? I have many questions for this painting bu no answers. It is a sublime riddle. Introducing "For Whom the Bell Tolls"
Ernest Hemingway wrote this famous novel in 1937 and Metallica gave it a musical voice in 1984. Years apart the message still resonates loudly today, unfortunately. We still have the belief system that we actually own this earth and continue to fight over borders which are man made. We have war in our world all primarily due to defining ownership. I will admit that this is a very simplistic view as I realize there is more to it than this but when taken to its core this is what war is all about. Death over borders, Death over who is right and who is wrong, Death over different ideology's. I am not immune to these sentiments since I am from Belfast Northern Ireland and years ago these ideology's caused a great many to die way too soon. 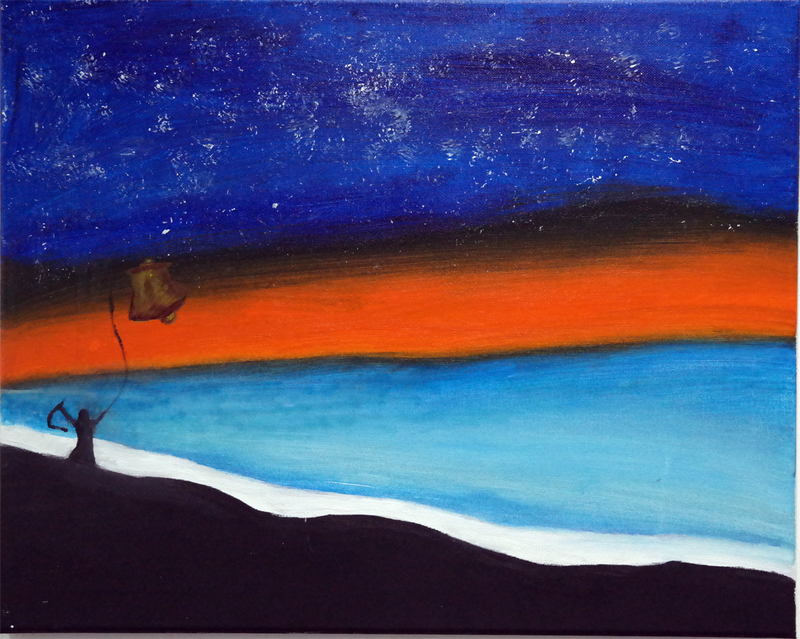 I chose to use bold colours for this painting to convey the depth of its meaning. We have Death depicted by the grim reaper ringing the bell. The hill is significant as it represents why the bell is present in the first place..
We all have that person or persons in our lives that seem to always be there to push our buttons, who always seem to make life just that little bit harder for everyone. We can chose how to react and to not waste our time on their, as my mother would say 'unfortunate personality" and see through to the fact that this how they see their world. Time is so very short and precious. Time is only wasted if we choose to use it for regret,jealousy,animosity and fear. We can chose to fill it up with patience, kindness, compassion and love. Surround yourself with those of like mind and your time here will never be wasted. 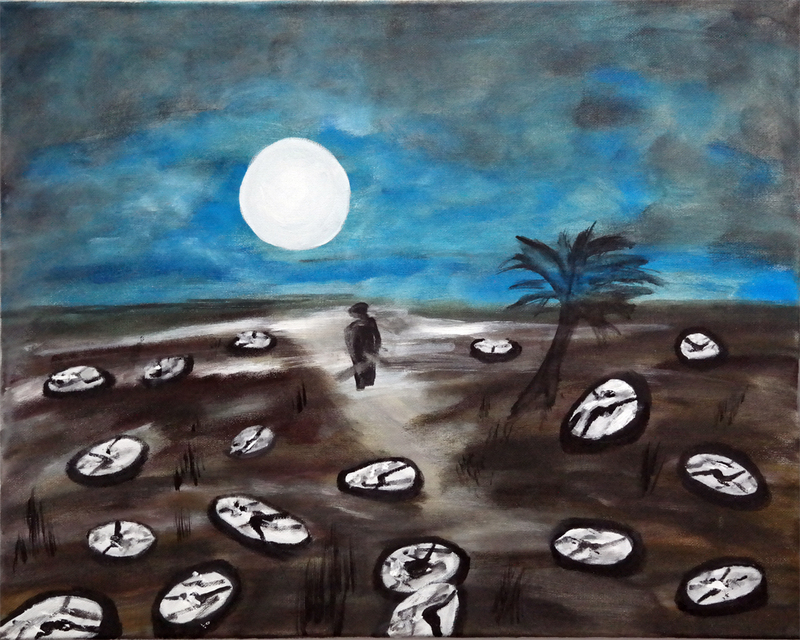 This surreal depiction of time shows a lone person looking at the cracked clocks which represent wasted time. The scene is beautiful yet stark showing the contrast in perceptions. In this year of 2017 this phrase should be never spoken to another " You can marry anyone – as long as they're exactly like us." it sounds antiquated and from a time before we recognized that we are all one race, the Human race. Yet this phrase is uttered by parents who mean well and are fearful because they have come to a new country with different rules. They fear that our Western culture will take away from their heritage so to keep this heritage alive outside of their country they place these stipulations on their children. The sad thing is that rules don't apply to the heart. The Heart wants what the Heart wants. This can be a bit of a taboo subject but I painted it in a very fanciful surreal way to take the edge of it. The bird carry's the heart of the one she loves to her and the other person is not totally seen just a foot and an arm to suggest that they are there. Below them is a town/city of sorts that I placed there as the division of the two. The sea is the natural element as it is what binds us as human beings, we all require water to live, it shows the sameness of us all. Introducing "One Step at a Time"
We always feel that time has the upper hand but is that just a matter of perspective.? Sometimes even though we feel like Time is ahead of us we need to just take life one step at a time. Living our life in moments and cherishing them all. This is how we beat time. Live in the moment. 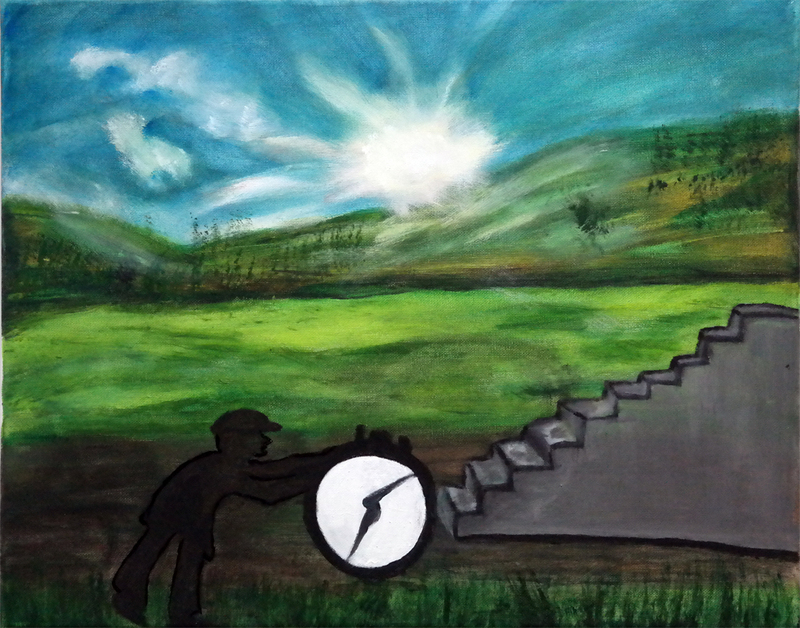 The depiction of the man pushing the clock to the stairs in front of him, symbolizes our struggle to just live in the moment and not be the consummate planner of all things always looking forward pushing that clock.. As he gets to the stairs it is definitely time to slow down as e ach stair symbolizes a moment and he must rest on each stair and live in that moment. I worked with the elderly for my profession helping them have a better quality of life by implementing physical and mental routines into their days that helped them retain not only their independence but their mental acuity. One day while on our usual walk with one of these wonderful people, she out of the blue said to me, I think its time for me to go Home. I looked at her and I knew that the statement was more than just that she wanted to go back to her room. It was an instinct an unknown knowledge that passed between us and I gave her a big hug. Two days later when I went to see her the floor nurse told me that she had taken to her bed and a day later she did Go Home. This is my tribute to her she was a phenomenal woman and did much in her life . There are people who leave their footprints behind in your heart and she definitely left hers there. Of course in real life no one goes sailing of a cliff with balloons in hand to the great white light, but in surrealism there are no ruels. The balloons symbolize the joy that was in this life. 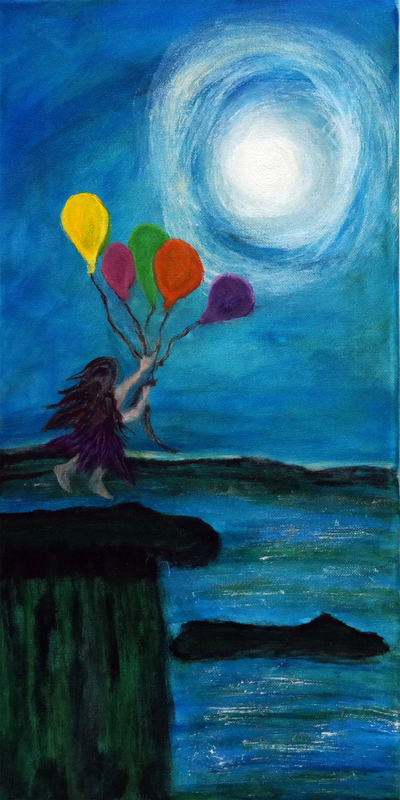 The light in the sky is where the balloons are taking her. The message Live your life in joy. As a woman I am only too aware of that Biological clock ticking down the seasons of my life . It marks out time in very definitive ways. There are markers given to us in our lives by this biological clock that we know decree to us that time is moving forward. Women in this regard mark time differently than men and are consciously aware of time passing just that little bit more. We see and feel the physicality of time. In this surreal depiction I have used the egg as the biological element showing the female link and the nest as home as we are the nurturers of this world. Each egg cracks open showing us the physical element of the clock and of the passage of time. Introducing "Loves me loves me not"
Remember when you were young and you had that major crush on the cutest boy or girl in school, I think we have all been there, I always seemed to go for the older guy or at least the one that looked older and yes so unattainable. This painting is about young love , they used to call it Puppy love hmm should have put a puppy in there too :) This was also fun to paint it was not as some of them have been overly emotional but still when your young and that cute guy or girl smiled at you it was very emotional! I used the drip method to portray the tears of the young and heart broken and the daisy like flower to show the Love or Love not aspect. We have all done that too at one time or another pulled poor daisy petals off in the hopes that it would say the Loves me and that in itself would be enough for just right then. And of course Hearts and broken hearts are symbolizes of those infamous phrases themselves. I hope you enjoy this painting and its message. So here is the question, is the sand running into the hourglass or out of the hourglass? Its a glass half full / half empty question. How do you live your life, are you waiting for the sand to run out? or are you trying to stuff more back in to give yourself more time. I personally am the latter:) I seem to find more and more that I want to do, see and accomplish, and yes I do feel that Time is running out. Its a hard balance being content with ones life and knowing that there is still so much to do, still so much to see and having that feeling of urgency. So I am going to try and stuff more sand into my hourglass whatever way I can. I am also fortunate that I have a great gene pool to pull from too, as my Great Aunt Eileen just turned 103 and bless her cotton socks shes still dancing! 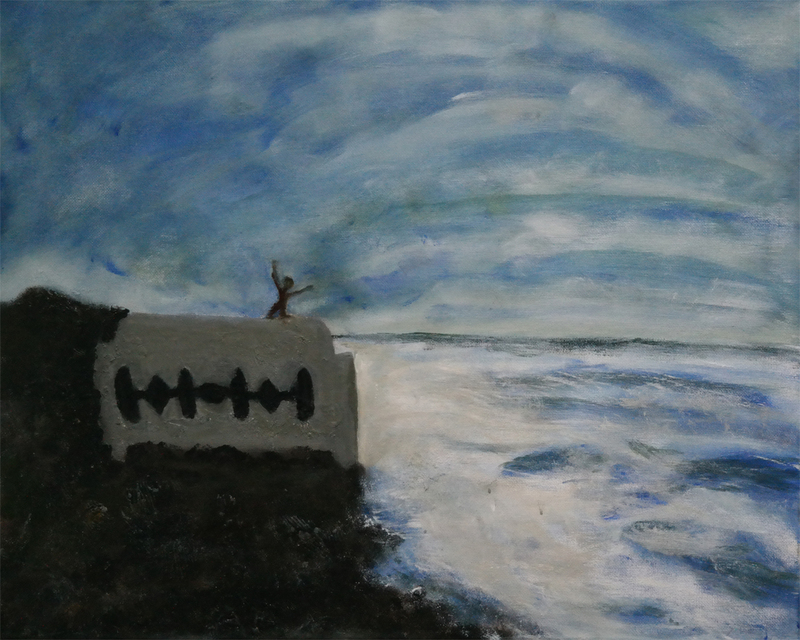 I have used and will continue to use the sea as back drops for these surreal depictions, I was born on an island and it is where I feel most awake. Any where near water brings me into my higher self. The hourglass represents time and is on the beach , where time starts and is forever infinite in its grains of sand , and the question above is depicted as sand on the sand. Introducing "The Part that Stings"
It is not those that have left this world who grieve but those that are left behind with the memories and the pain of that remembering. We keep these memories close to our heart, never to be forgotten.This to me is the part that stings. Maya Angelou is one of my favorite go to authors she was wise, full of insight and she knew how to put raw feelings into speakable truths. In this depiction I tried to alleviate that sting by the words written on the tombstones, a very satirical way to look at death. I am Irish, we seem to have a way of doing that, to us it is a part of life and we have wakes, big parties celebrating that persons life. I think that this is healthy. Introducing "Home is Where the Heart Lives"
Home, what ever that means to each and every one of us, it is for sure always a place to softly fall and most definitely where our heart lives. This can be a physical or an emotional place and is most likely both. The word Home in of itself is a comfort word. A place of retreat from the world and a place that we keep in our hearts. Its that place that is our go to when things feel a bit too hectic and raw in this world of ours. We know that love is there for us unconditionally and given freely. 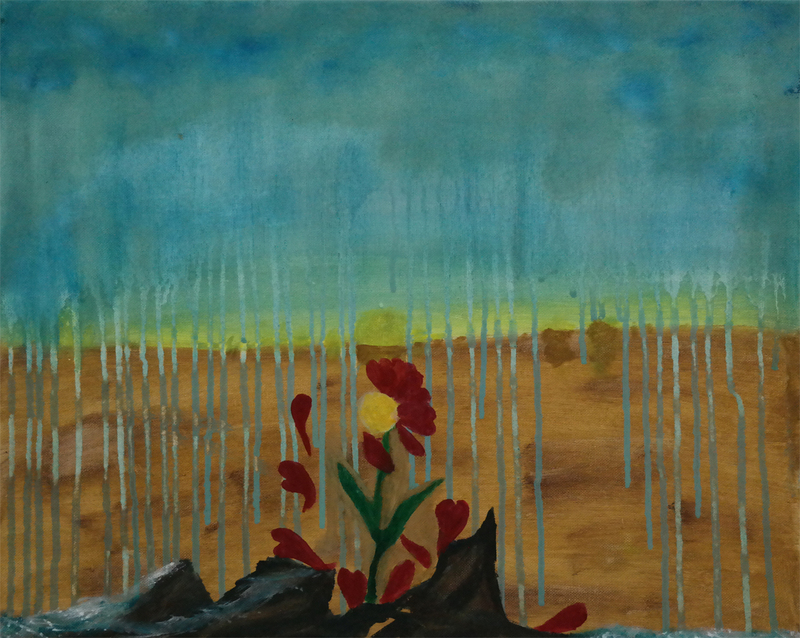 In this depiction I have used again water as our grounding to our earth and a tree as being the symbol of stability and security. The house itself symbolizes home and the hearts show the Love that it contains within its walls. This was fun to paint and I hope you enjoy its uplifting and comforting message. 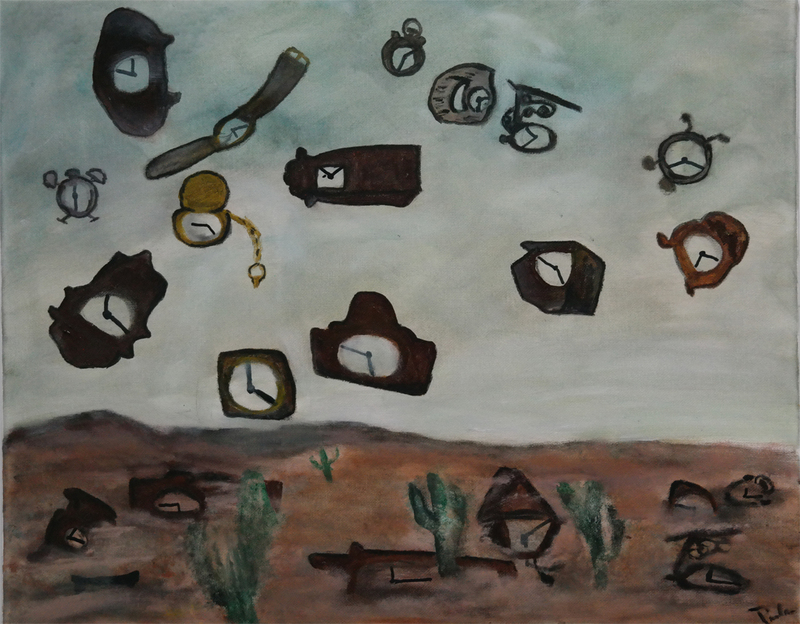 Introducing "Time is Like a River"
This quote from an anonymous source sums up this painting perfectly. Yes, time keeps ticking so lets all be the best selves we can be in this world, and never put off today because you think you can do it tomorrow. 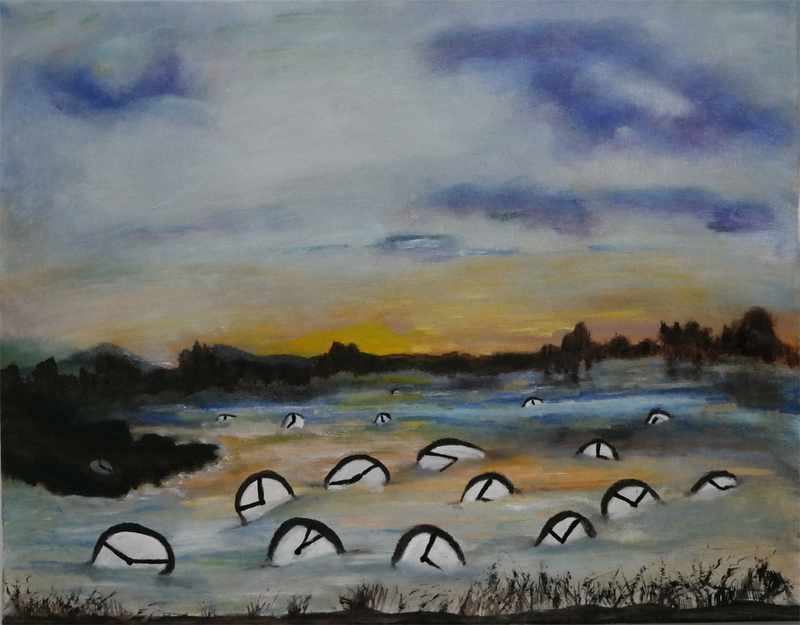 My depiction of clocks floating down a river creates the surrealistic feel of this piece, without the clocks it would still be a cool river scene painting. When was the last time you saw clocks floating down a river? How do you envision your last journey ? Its still a mystery and always will be as to what happens when we pass from this earthly realm. Faith has a lot to do with how people see this passage, we have faith that there is another place whatever you want to call it Heaven, Nirvana, The Infinite space. I believe that this helps us too , the ones that are still here somehow knowing that those that are gone are in a better place or at least somewhere more than here. 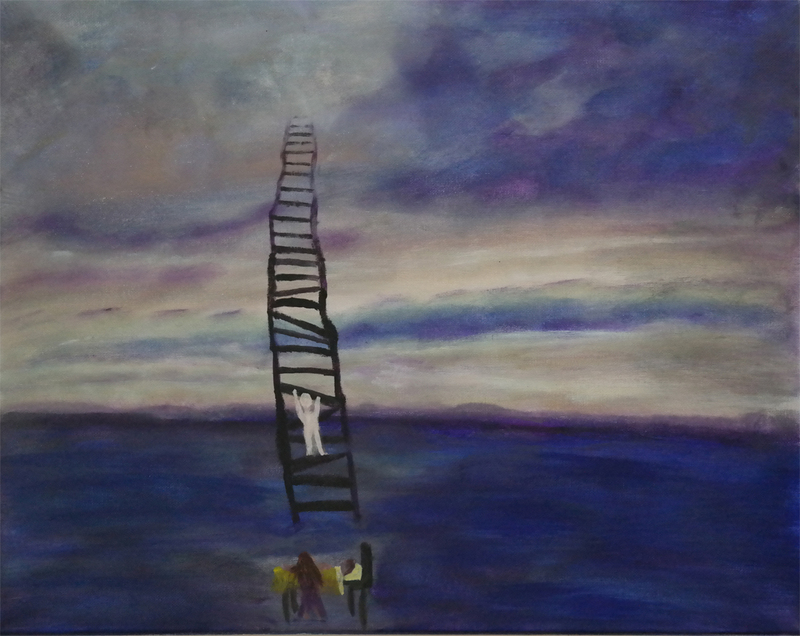 In this surreal depiction I painted a ladder reaching into and disappearing into the sky, its a long ladder:) A small scene below shows that we have said goodbye and the figure climbing the ladder is on their journey home. Again I use the backdrop of the sea due to its calming influence on us. I always feel better by the sea. To me this painting is poignant yet calm. Seriously though we are so very resilient as human beings we go through many heart breaking moments in our lives yet we bounce back, most of the time learning and growing from that experience. “Tis better to have loved and lost Than never to have loved at all.” ― Alfred Tennyson True words spoken by Mr Tennyson. 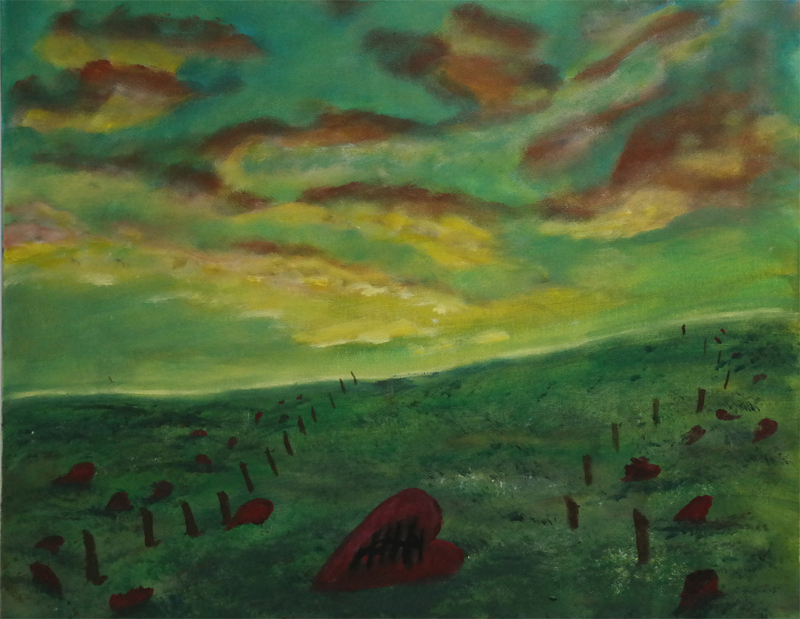 In this painting I decided that a field littered with broken hearts would depict our many heartbreaks in life and at the end of that field of course as resilient as we are our heart is all stitched back together. The depiction of a field on a somewhat sunny day shows that even with a broken heart life is beautiful and does go on. We all have constraints put on our time, appointments, work, personal life stuff, sometimes it feels like we are shackled by time and we forget what is really important. We say "oh we will get to that place one day" wherever that place may be, or "I wish we could do this", whatever this could be or the big one I wish we could see friends and extended family more often. We dont seem to realize that we actually can if we truly wanted to. Shackles of Time is about our perceived reality and how we use our time and how we all, myself included let Time slip away from us by not doing what we truly want to do because of those perceived constraints that we place upon ourselves and our time. 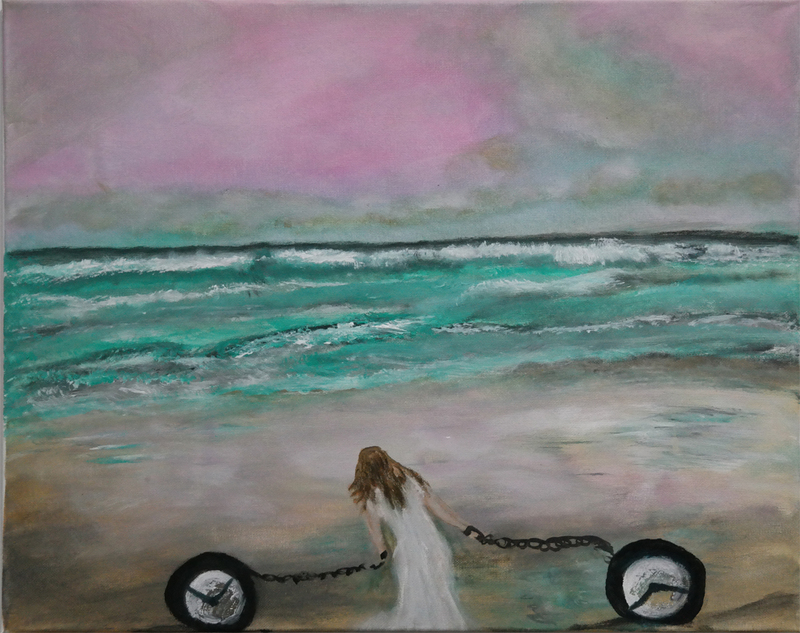 I choose to show the shackles as clocks chained to the person dragging them along like weighted objects, which is our perceived reality trying to prevent us from using our time for what we love. 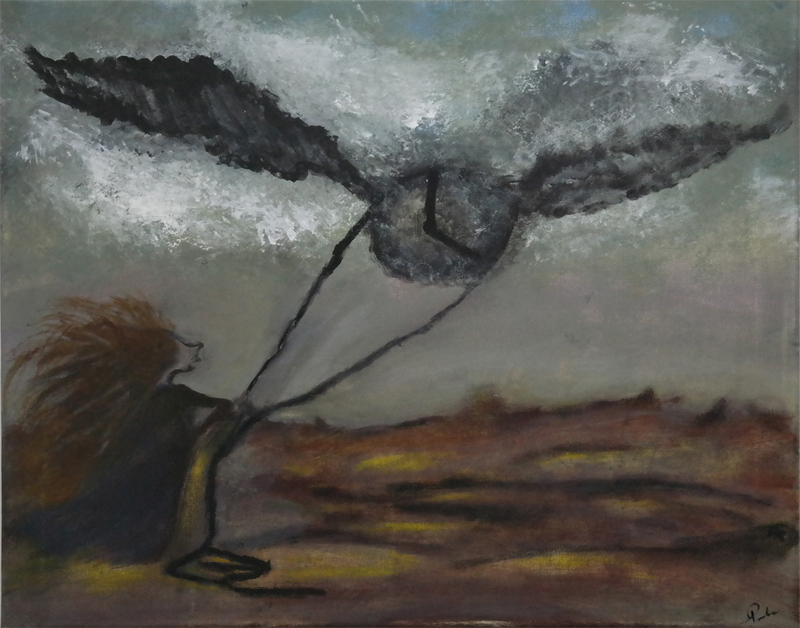 There are many symbolic meanings in this piece,Oh how my brain works sometimes tis a scary thing! Yes of course there is the bright light that we hear about in all those near death stories but look closer. There is a guide giving direction. The crossing over turbulent waters is like that of us living our daily lives with all of our human struggles and perceived ideas. The heartbeat ends just as they reach greener pastures. The old saying the grass is greener on the other side comes to mind. I also purposefully created the illusion of the corporal body being almost opaque. We are born into this world naked so I feel that we take nothing with us on our journey home. This is a contemplative piece I hope you enjoy it. Our parents are our guardians, our protectors as we make our way into adulthood. There is an unconditional love and and deep emotional bond between a parent and a child. They give us advice and are always there for us with reassurances and guidance. As children we are carefree and seem to not know or maybe its not understand our limitations. Perhaps that is the correct way of thinking maybe we need to bring some of that attitude into our adulthood in fact we only truly fail if we never try. My mother always told me that there was no such word as can"t. I never really understood that phrase when I was young but as I get older I do appreciate those words and I try to live by them now as an adult. And yes my parents are some of the biggest supporters of my work and I love to hear their critiques,sometimes they are extremely blunt and are always flavoured with that Irish sarcasm and wit. So you see even at my ahem age parents are very influential. I depicted the faces of the parents as cliff sides,always there and ever steadfast and of course the child as being somewhat carefree and a bit of a rebel sitting in a precarious place yet also being Watched over and protected. We all feel like we are rushed off our feet these days, so much to do and so little time. What if we could just stop Time for just a bit till we catch up. Hmm problem with that is that most of us would probably try to do more than catch up and try to do again too much! The saying the hurrier I get the fartherer behind I become comes to mind. I hope you enjoy this piece.Lets all take a breath and try to stop Time for awhile. 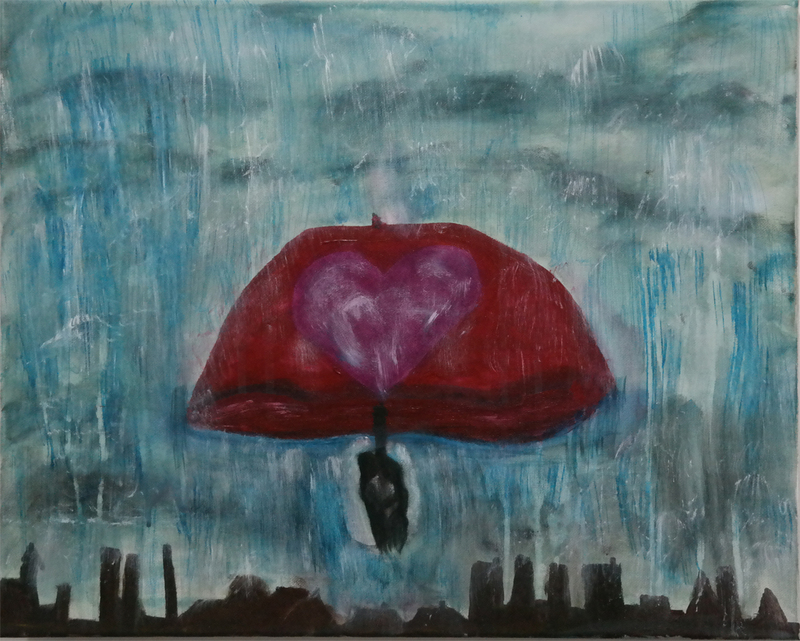 I thought of a a city scene with two people up in a rainy sky under a very big bright red umbrella. The Umbrella symbolizes their togetherness in the face of adversity which in this case is symbolized by the city and the rain storm. Loves path does not always run smoothly and can be influenced by outside situations. 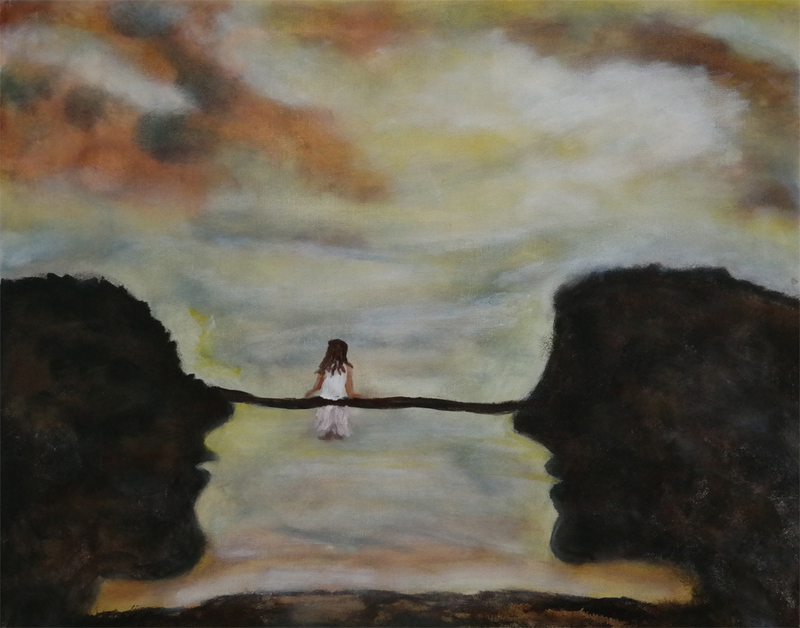 Sometimes this is detrimental to the relationship but other times it binds the relationship tighter together as I have depicted in this painting. As they say Love conquers all. As we live our daily lives we all have a unique albeit unfortunate connection to one another. At some time we will or have said a final goodbye to someone we love. 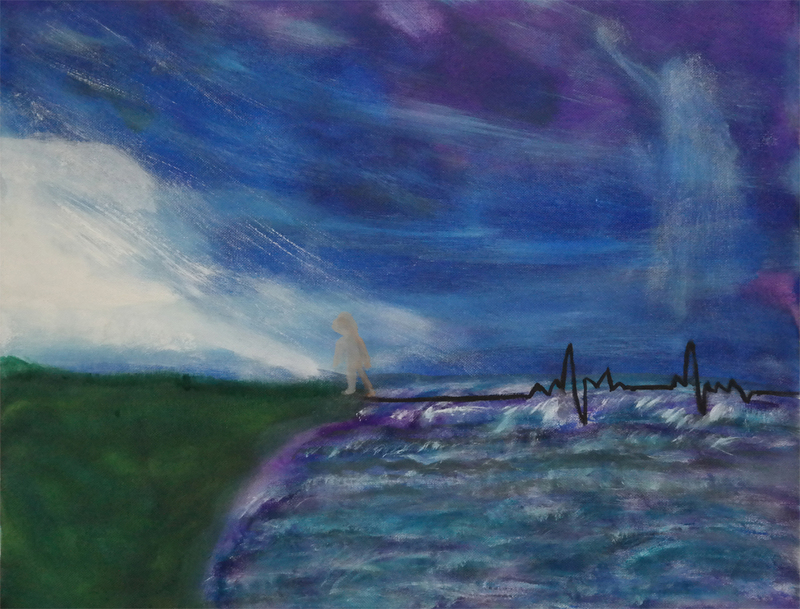 This painting depicts how that connection to that person continues on. We have a Dedicated Line to them for as long as we remember them and our souls will be forever connected. We may even have conversations with them and see them in our minds eye and imagine their unique responses. The scene I picked is also about connection, our unique connection to the sea, the salt is in our blood and we are made up of over 50 percent water. Water is a Life Force and we are bound to it as we live out our earthly lives. 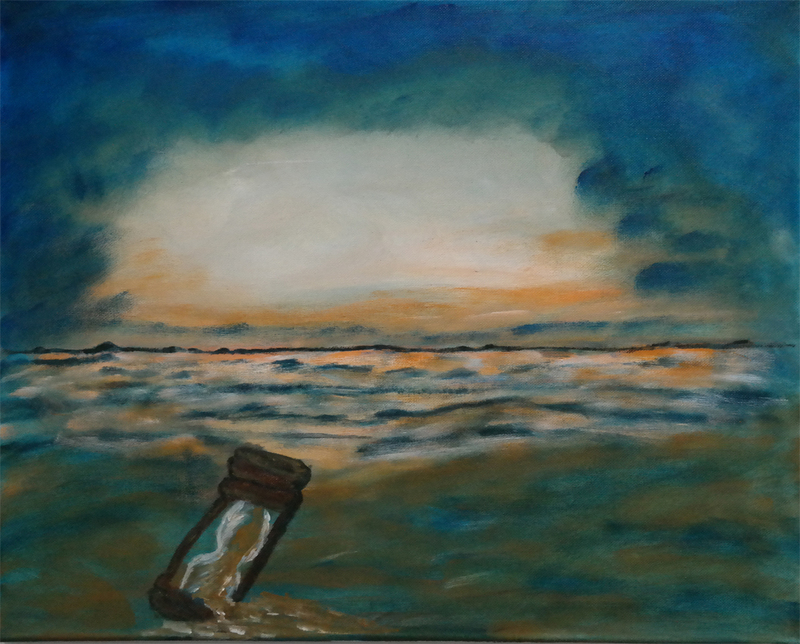 I was going to call this painting The Sands of Time but when I showed it to my father he named it Tempus Fugit which means Time Flies and it stuck! Sometimes other people see things in your paintings that bring it into a different space. When I looked at it again with this title and his eyes it made perfect sense clocks flying out of the air and yes my father is very correct as Time does fly. I look at my parents and sometimes forget that they are nearing that 80 mark I still see them as they were ten years ago, ailments and all. Sometimes my expectations of them exceeds now their capabilities that in itself is a very sobering thought. also as they age so do I..
Time is one of those few things iin life that we have no control over and every minute is a gift. Day 5 of my 30 paintings in 30 days challenge "The Waiting Room"
So what's behind the door? Who are they waiting for? 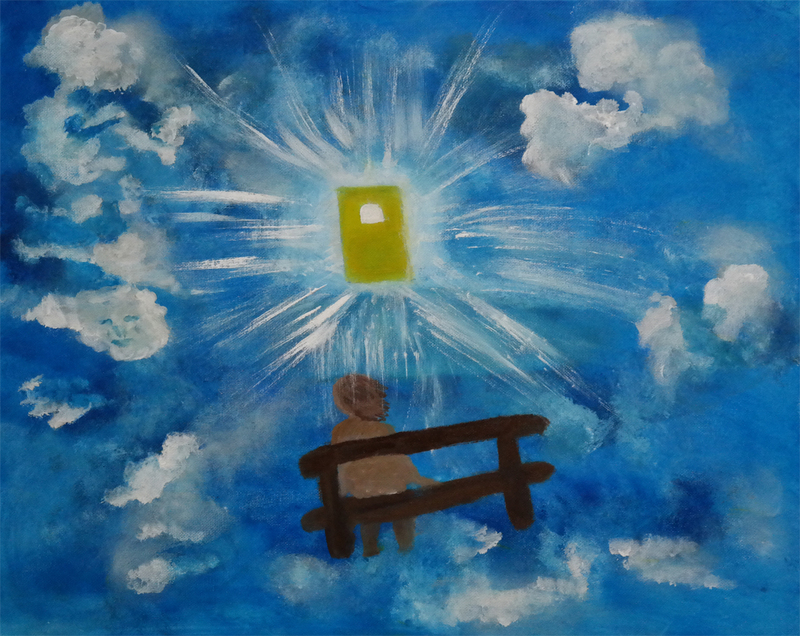 Why are they in the sky on a bench?! Well I will only answer one of the questions the other two I leave up to you. Look closely someone is watching! I leave the other two questions for you to answer. 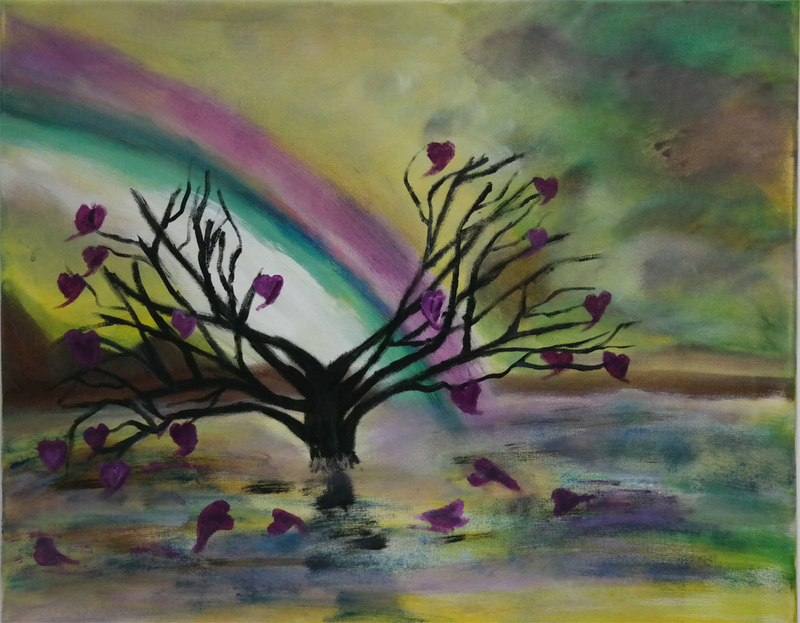 Day 4 of my 30 paintings in 30 days Challenge Today I introduce to you "Love Blossoms"
In this painting I try to show that Love can bloom in the strangest of places a Tree in the middle of a lake. Love blooms all around it as the sky itself blooms with rainbow colour. I tried to capture the feeling of burgeoning love falling from the tree flowing to those who choose to let Love in to their souls. This is not always easy but well worth the effort as life gives us this very special opportunity to show another who we truly are. 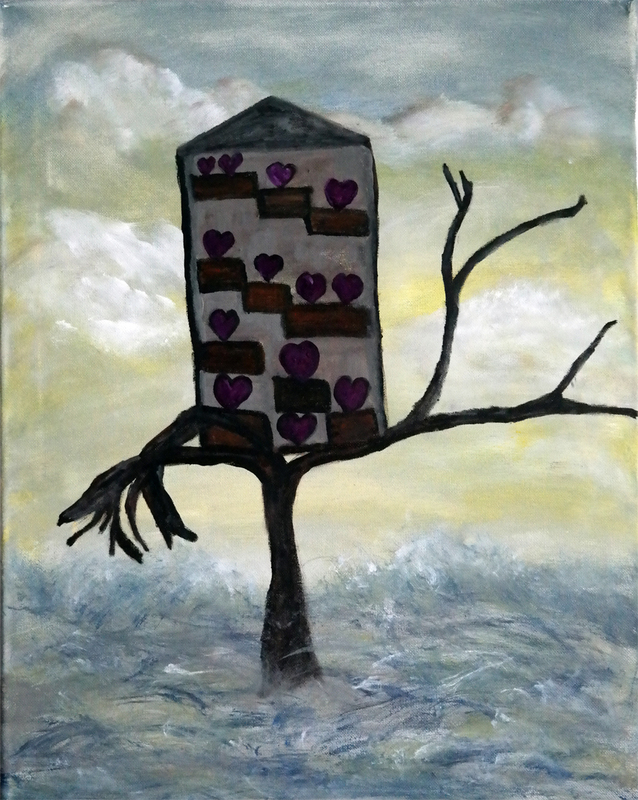 This is my second painting showing my surreal concept of Love. Introducing "On the Edge "
Yup that's a razor blade stuck in the side of a cliff which I appropriately named On the Edge.. a bit tongue in cheek for a very important message. There is beauty all around us yet sometimes we don't see it because our life is being cut short by circumstances that we never knew about and have no control over. We start living life on the edge between being here, giving up and the other side. The blade is symbolic of the feeling inside us that we can't get rid of due to our lack of control. At some point in our journey we start to see the beauty around us again and relinquish ourselves to the edge and funny enough the sharpest of blades really do not cause pain. This is my first surreal concept on Death. Nine more to go. 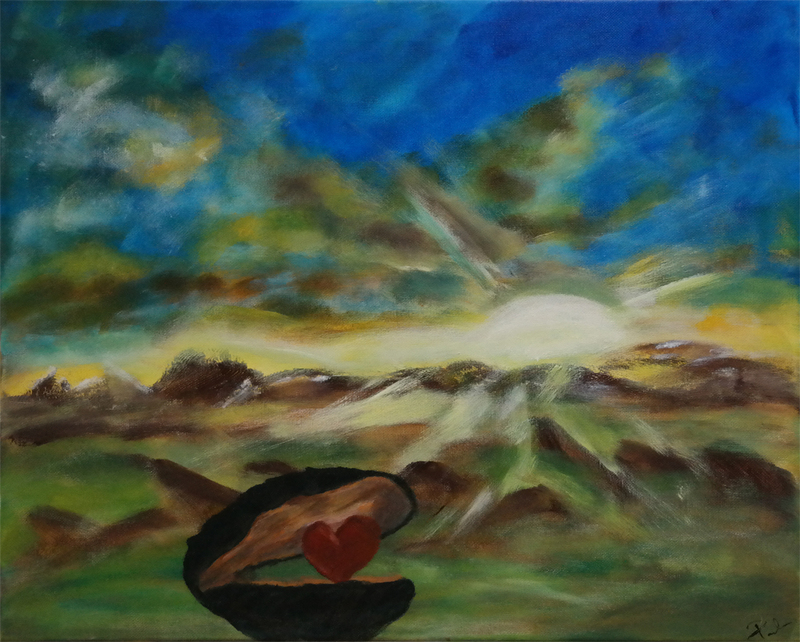 "Finding Love" is the first of ten in the Love abstract. We are all are looking for Love some of us in the wrong places yet still it gets found! The title was appropriate, usually you would not find a heart in a clam shell and it would definitely not be on a grassy knoll! Today January 2, 2017, is Day 1 of my 30 paintings in 30 days challenge. My theme is inspired by the movie Collateral Beauty .The movie was panned by critics but I found it a breath of fresh air from most of the stuff out there, but that's just me :)) This is the quote from the movie that inspired my theme. "We're here to connect. Love, time, death. Now these three things connect every single human being on earth. We long for love, we wish we had more time and we fear death."